at the perfect moment today, hehe. as of the past few months, I have been all about thrifting. which has been a recent trend in all of my outfits. new items to be up in the shop that I just scored, after they are hemmed. wearing: thrifted skirt, jean jacket, bag, & tank; wal-mart tights; H&M shoes. I can't believe that cat posed! My dogs never cooperate. Anyways, I love that you always wear florals, I can never find the right kind. Haha oh my gosh i just love the cat in the picture! Adorable outfit. such a cute cat! love the outfit. especially the accessories. love the alice and wonderland shoots from your last post too! cant wait til its warmer too !! that cat is sooo adorable, he's posing! You've got a fantastic sense of style. And that kitty is too cute! 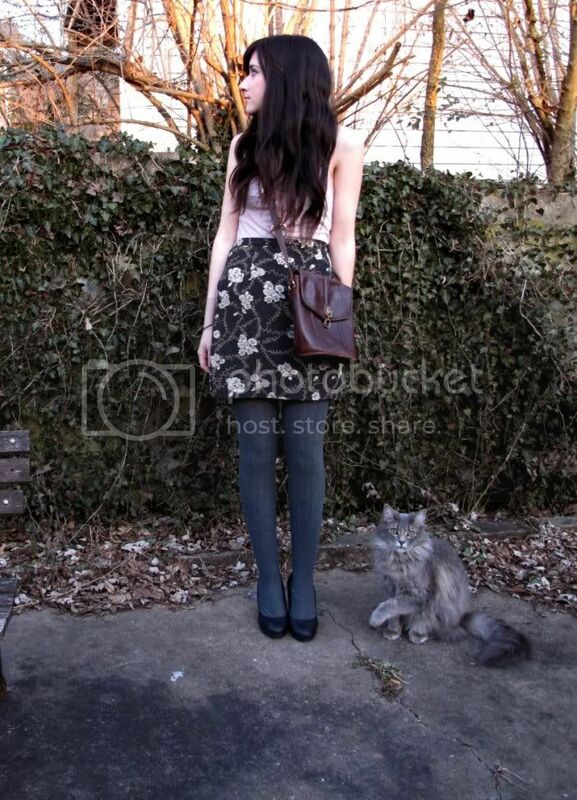 I love your outfit, that bag is amazing, and your cat….ADORABLE! i totally agree with you about the thrifting and the cat! 2) i also really love thrifting. it's so much more rewarding than just walking into any store and grabbing whatever the mannequin is wearing. 3) that skirt is beautiful btw! Where can I find a cat like this one? Do you want to trade? Mine's nothing like this one. I'm starting to get more excited about thrifting than regular shopping. Hooray for buying secondhand! Isn't it great to wear an outfit that is almost entirely thrifted? Ah, I love doing that. ooh, I love your bag! really cute outfit! and the cat should be a model! so photogenic!!! I love woolen tights so much! Such a pretty skirt! I totally agree on thrifting. It's so much more fun than regular shopping sometimes, and of course, way cheaper! i like this look ! i love that you always double post! oh oh i fell in love with this outfit! it's so sweet and vintage! thanks for your comment on my blog. you're gorgeous! 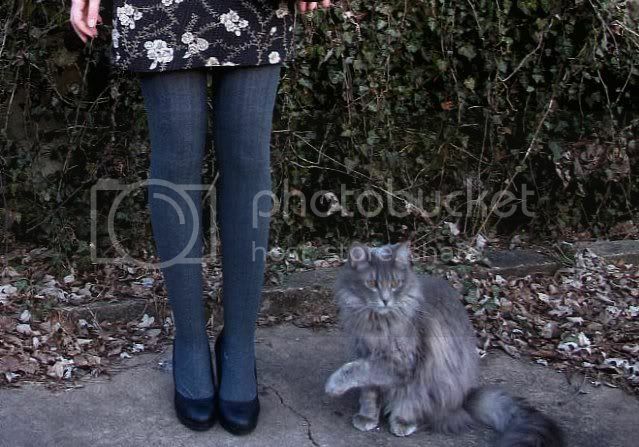 That skirt and shoes are really nice!...and your cat its cute! Lovely skirt! especially with those tights! Enter my giveaway to win a cute beret for Spring! Ahaha how adorable is the cat next to you? I love it. 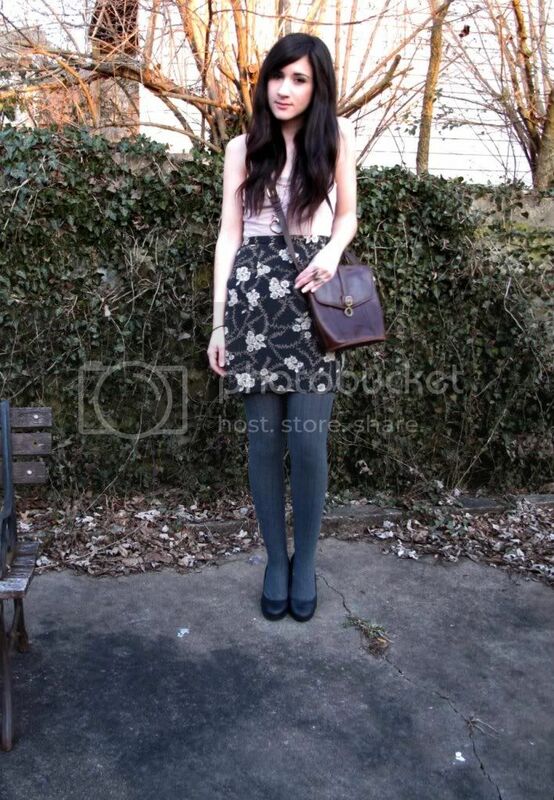 I really love that skirt too and so much better that it's a vintage find! I've missed your blog! That's really cool the way you're thinking about thrifting as a completely viable option to stay stylish. Those thick grey winter tights look so cosy! I really like your skirt,its beautiful! Your skirt is lovely, aren't you cold though?! Oh you look so adorable, dear! 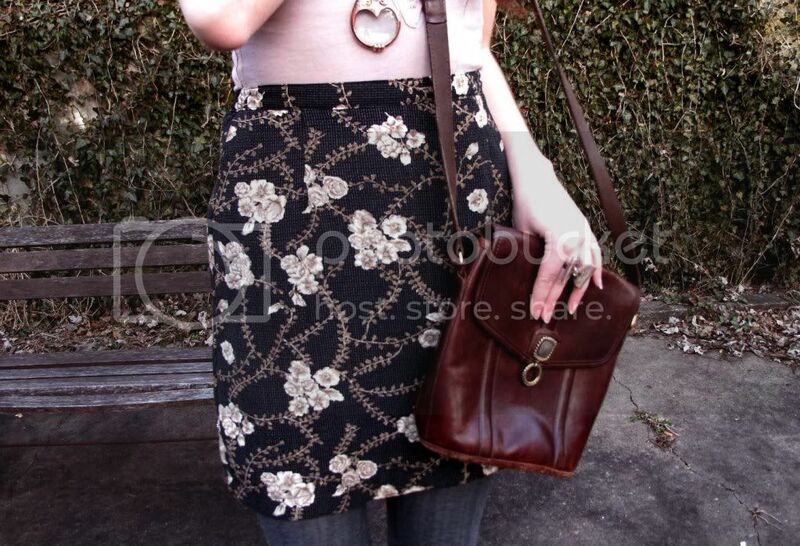 That skirt and bag are absolutely gorgeous! I wish I had as good thrift stores as you've got! Love your outfit, so cute & classic! cute little outfit ! great skirt ! and oh i love your bag so much !! Once I started thrifting, retail clothes became less appealing to me too. I mean, I can get 4 items for the cost of one shirt thrifting! So, why bother, ya know?